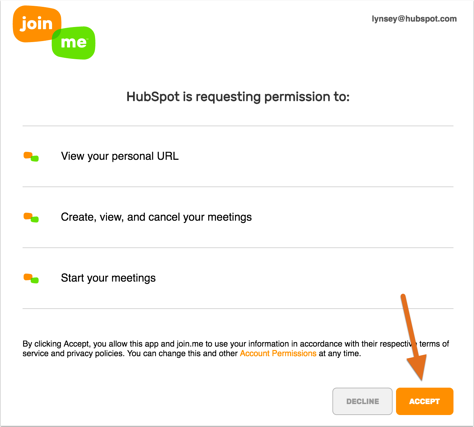 HubSpot's integration with join.me enables sales teams to quickly create and launch calls, video conferences, and screenshares from within contact, company, and deal timelines in HubSpot. Navigate to Contacts, Companies, or Deals. Click the name of the contact, company, or deal. Schedule a new meeting or navigate to a previously scheduled meeting on the timeline. Click the Actions dropdown menu in the top right corner of the scheduled meeting event on the timeline. Hover over Create join.me and click Log in. In the dialog box, enter your credentials for join.me if you aren't already logged in on your browser. Now you'll be able to click Create join.me on any meeting on the timeline. Once you create the join.me meeting, you'll be able to send an invite to the contact from within the meeting.